On Monday afternoon, Apple Inc. CEO Tim Cook (also known as “Tim Apple”) hosted a keynote event to unveil the company’s new initiatives, including a new video-streaming service and a news subscription service. 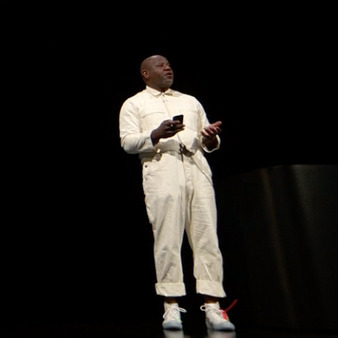 There was plenty to dissect, but when Cook invited Wyatt Mitchell, Apple’s director of app design, onto the stage, the focus quickly shifted to Mitchell’s super-cool outfit, which consisted of a white jumpsuit and Off-White sneakers. Michell’s getup was a far cry from the typical Silicon Valley uniform of black turtlenecks, blue jeans, and Allbirds sneakers — and thank God for that. Perhaps Mitchell and Cook have seen the Elizabeth Holmes documentary? Either way, it’s high time someone switched things up. Twitter users were quick to comment on Mitchell’s jumpsuit. “Finally, a real fashion moment at an Apple event,” read a Mashable headline. Those close to Mitchell say that his jumpsuit might not be as random as it seems. It could have been inspired by the late, great photographer George Pitts, who was known to wear a similar Dickies jumpsuit to his various places of work. Mitchell worked under Pitts at Vibe magazine, where Pitts was photo director from 1993 to 2004. It’s likely that his style left an impression on Mitchell, among other things. Pitts passed two years ago this month. The Cut has reached out to Mitchell directly to see if he has anything to add. In the meantime, we’ll use our Apple devices to cop a jumpsuit just like his. Is This the Story Behind That Apple Guy’s Jumpsuit?